Helmets are a must to keep your head protected. Most of our helmets meant for water use and don't have absorbent foam, while others are warmer and meant for land and snow use. We carry helmets with and without ear flaps; ear flaps protect your ears from rushing water, other objects, and impact. 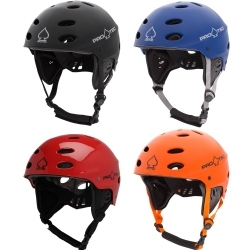 The Pro-Tec Ace Water Helmet is known for its style, comfort, and adjustability for any watersport activity, whether you're wakeboarding, kayaking or kiteboarding. The Ace Water Helmet is loaded with features. The Pro-Tec Ace Wake Helmet is known for its style, comfort, and adjustability for any watersport activity, whether you're wakeboarding, kayaking or kiteboarding. The Ace Wake Helmet is loaded with features. 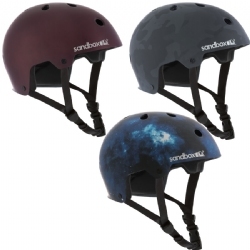 The Sandbox Legend Low Rider helmet is a skate style inspired helmet. It comes complete with two sets of water sport sizing fit pads. This helmet is designed for multiple sport impacts and great for kiteboarding, wakeboarding at the cable park, or kayaking. 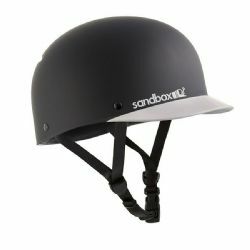 The Sandbox Classic 2.0 Low Rider helmet comes complete with two sets of water sport sizing fit pads. 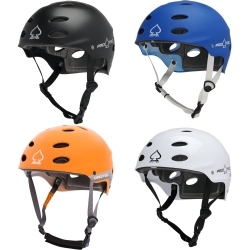 This helmet is designed for multiple sport impacts and great for kiteboarding, wakeboarding at the cable park, or kayaking.